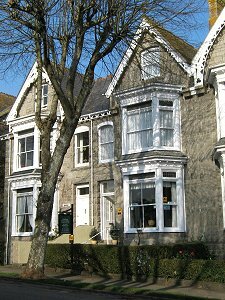 The Dunedin is a large Victorian Guest House built in 1886 and provides AA 4-Star rated bed and breakfast accommodation. Our sleeping accommodation consists of 8 tastefully furnished bedrooms, all of which have recently been re-decorated, re-furnished and re-carpeted. All our bedrooms have modern en-suite facilities, flatscreen FreeView digital colour TV's, DVD players, radio alarms, hair dryers, cooling fans and tea/coffee making facilities. Our Guest House is situated in a wide and tree-lined avenue leading to the seafront, with its long promenade and sheltered bay, which is only a few minutes walk away. From the promenade, St. Michael's Mount can be seen towering up out of Mounts Bay and the fishing village of Newlyn can be seen nestling on the other side of the bay. On the edge of Penzance town centre, but within a few short minutes walk, The Dunedin is ideally situated to visit all the pubs, restaurants and other attractions in Penzance. Some of the other attractions in the West Cornwall area include Land's End, Mousehole, St Ives, the Minack Theatre and many more. 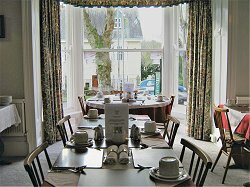 Breakfast is served in our bright and airy dining room and there is a wide selection of cereals, fruit juices & segments and cooked-to-order hot main courses to suit a variety of tastes and preferences. The "BT Infinity Superfast Broadband" wireless internet network is now available to our Guests throughout The Dunedin. This is a totally free and unrestricted service for our Guests. Please ensure that your device has a wireless card or USB adapter, appropriate virus protection and a firewall. Download speeds of up to 76 Mb are possible. To experience all the features of The Dunedin, you can now see our Video Tour ..... and, to find out about the origins of the name of Dunedin, see our History page.